Summon: Give a creature a Ward. Wardcrafter is a rare Intelligence creature card. It is part of the Core Set. 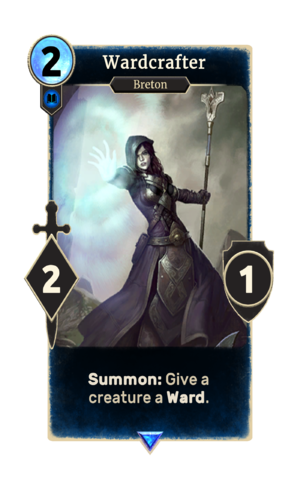 In addition to the card's availability in the Core Set, two copies are included in the Ancano's Cunning theme deck, one copy in the Dagoth's Might theme deck, and one copy in the Tribunal Glory theme deck. "I will have your head!" This page was last modified on 15 February 2019, at 00:34.